I remember thumbprint cookies from my childhood. I always think of them as Christmas cookies because that is when my family would make them, but the truth is that they are popular cookies any time of the year. I love the little pile of jam in the center and would try to save that for the last bite. Cream the butter and sugar. 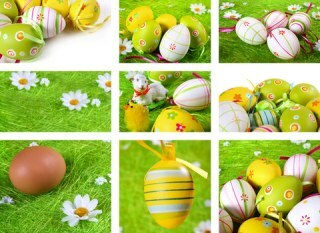 Add the egg yolk, flour and vanilla. Shape into small balls. Dip the balls into the egg white. Roll in nuts. Lay the cookie ball on a baking sheet. Press it down, making an indentation in the center with your thumb or finger. When baked fill the center of each cookie with jam. Bake at 325ºF for 10 minutes. Use your favorite flavor of jam. It’s nice to use a variety of flavors, so people can have their pick. Try raspberry jam, strawberry, blackberry jam, apricot or peach jam. Replace the dollop of jam with colorful half candied cherries around the holidays as in the image above. 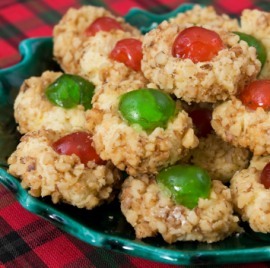 Thumbprint cookies really brighten up a holiday dessert tray. This is such an easy cookie recipe to make and so delicious. A good crunchy cookie, coated with nuts which is always a good thing, then you get to the little jam gem in the middle. Just so good! One of my favorite things to do, especially around the holidays, is to replace the jam with a colorful candied half cherry. Do half the cookies with green cherries and half topped with red cherries (see the photo above) for a really festive cookie. If you take part in a Christmas cookie exchange, these cookies are perfect. Delicious and colorful everyone will appreciate getting a few of these for their own cookie trays. You can create memories too with these wonderful cookies. I think you will love them as much as I do. Enjoy. Thumbprint cookies are just one of the many cookie treats we have for you on the site. Look here to find them all.